Backyard beekeeping getting a lot of buzz in L.A. 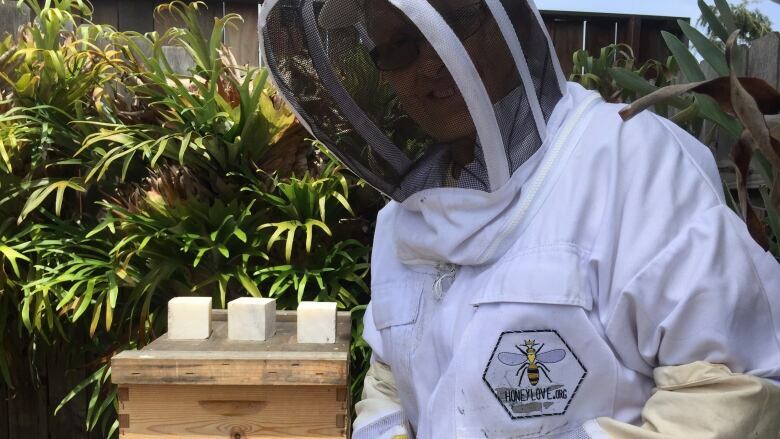 Bees, threatened by colony collapse disorder, are getting a helping hand in Los Angeles. Although backyard beekeepers are breaking the law, one city councillor expects the movement will be legal by the end of this year. Sylvia Henry looks like she's about to go fencing. She adjusts a stiff white full-body protective suit with a hood and mesh. The last step: elbow-high yellow gloves. "Now you zip these all the way around. So you're ready to go to space," she laughs. I'm not laughing because I have no body suit, only a mask. I ask her if she's ever been stung. "Once, in the ankle," she says. Bees usually warn you before they sting, according to Henry. "They sort of bump you first." And then she takes me to her hive. At the end of her small Los Angeles backyard, past the fountain and the hummingbird feeder, there's a metre-tall wooden box. She opens the top and hauls out a wooden rectangle covered in bees. "There are probably 20,000 bees in here and probably another 10,000 out and about," Henry says. A couple of days ago she collected several jars of honey. But that's not why the 67-year-old retiree decided a couple of months ago to become an amateur apiarist. She wants to save the bees. "They call it backwards beekeeping, because it just lets the bees do what they've always done, not really interfere," she says. "The bees that are in the hives that they're using for pollination in large fields are having a lot of problems. They're using pesticides that are terrible for the bees." Scientists call it colony collapse disorder. Honeybees are dying off all over the world and no one knows exactly why. Some researchers blame it on a family of pesticides called neonicotinoids, though it's believed viruses, mites and fungi also play a role in the mass deaths. But unlike the honeybees in commercial apiaries in rural areas, the urban bees seem to be thriving, likely because they aren't exposed to agricultural pesticides. Urban bees also have a greater variety of vegetation to feed on than many bees on farms, which are only exposed to the flowers from one or two types of crops grown in the area. "I just let them be, making thousand-flower honey because they can go anywhere from the hive up to five miles away each time they make a trip," Henry says. "The more of us that can have home hives, the healthier we can keep the population." But the city isn't entirely safe for the bees. What Henry's doing is actually illegal. Los Angeles allows her to keep her five chickens in her backyard, but — unlike Toronto and New York — not bees. 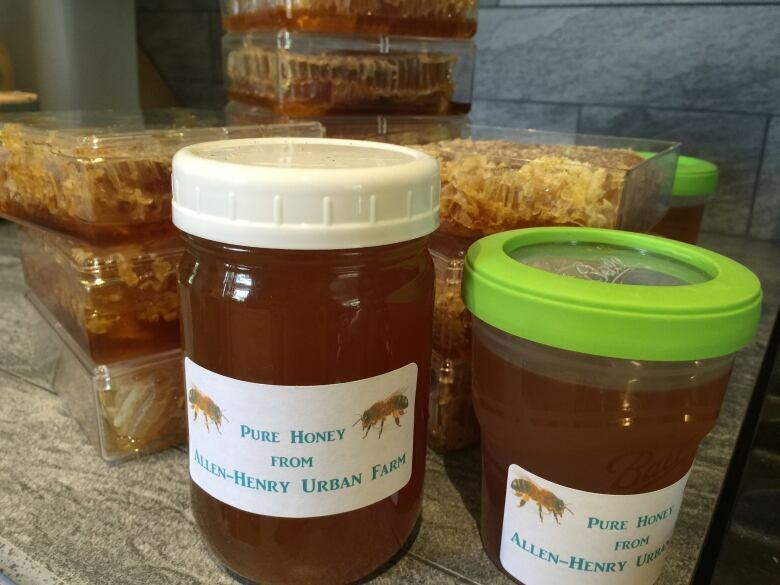 A recent case demonstrates why there's been opposition to urban apiaries. On July 5, a Los Angeles-area man who kept bees in his backyard was stung more than 100 times. His golden retriever Daisy died from stings. But that doesn't worry Santa Monica's Paul Hekimian. He gives his son Lucas, 9, a push on the zip line he built in his backyard. The line ends about two metres from his two beehives. "The bees are not going to hurt anyone," Hekimian says. "They're here to work." He thinks opposition to backyard beekeeping is illogical. "The bees are already here," he says. "There are somewhere around nine to 11 wild hives per square mile in the city." 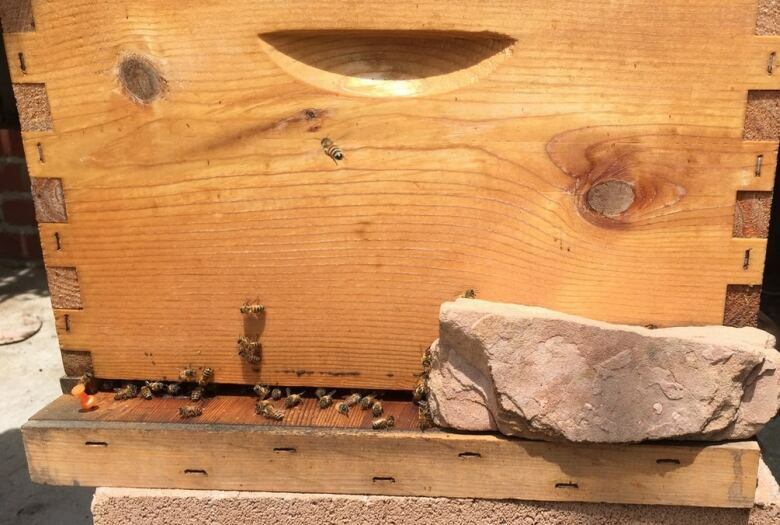 When residents come across hives or swarms, they often call the city to dispose of them. "They call it bag 'em and drop 'em," Hekimian says. "They bag 'em in a bag and drop them in the trash. And unfortunately there's a lot of that going on. [The bees] have to go somewhere. So if we can capture them and put them in a 'foster home' and raise them, if you will ... those bees can last for years." He and a group of concerned beekeepers took the bees' case to city hall. Now Coun. Paul Koretz is trying to get the bylaw changed — even though he's so allergic that a sting once paralyzed his leg for three weeks. "It's not because I want more bees in my home," Koretz says. "At least we want to be sure somewhere in the U.S., bees are healthy and are being kept, and if at some point we need help repopulating other areas, we should be doing that." So far, every decision at L.A. city council has gone pro-bee. Koretz expects backyard beekeeping will be legalized by the end of the year. But Henry didn't want to wait. "I just decided I'd be ahead of the ball game," she smiles. She replaces the lid, careful not to injure any of the hundreds of bees clinging to the top. I ask if she's worried the city will confiscate her bees. "I think they have a lot of other things to worry about more, because there's certainly not a lot of news about people getting stung." Which is good news for me, because I'm pretty sure I'm being bumped. "You're being surrounded by bees, yes," she laughs. "They're just going around your head." It's only my head, but I flee into house anyway. Followed by bees. "They can stay grumpy for a little while," Henry says. She grabs a broom and tries to shoo the grumpy bees back into the backyard — back where she says they belong.